C’mon, Who Really Wrote it? : William Dogherty in 1953. His one and only Hardy Boys book. Was It Revised? : Yes, in 1971 by Pricilla Baker-Carr. Cover: Rudy Nappi. 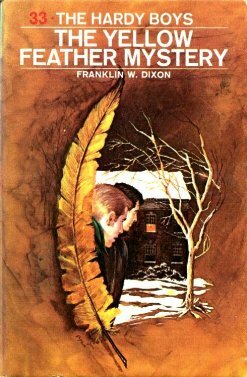 A burnt orange/yellow cover, with a mixture of symbolism (the feather) and realism (Frank and Joe looking at the cabin in a scene right from the book). To be honest, this nearly monochromatic cover put me off when I first reread this book as an adult. But as we shall see, I should not have judged a book by its cover. Setting: Bayport and nearby. They don’t travel too far afield here. Where’s Fenton This Time? : He is working on the same case, and shows up quite often. The author even has some fun with Fenton’s appearances in a couple of cases. When Frank tackles his father thinking he caught a crook, you know the author is winking at us. What’s Chet’s Hobby This Time? : He built a catamaran on ice, as it were. A fan-driven ice boat. Yes, it comes in handy. Chet is the third Hardy Boy in this book and he really steps up. No cowardice in this one, he just does the job. When the gang is all together and Frank and Joe realize they have to check a place of danger out, it’s only Chet they ask to come along. The author must have really liked Chet. Aunt Gertrude’s Dessert: Nothing doing, check back later. Plot: The headmaster of a boarding school dies, leaves behind a clue to where to find his will, and two people are after it. Both of them ask the Hardys for help finding it.